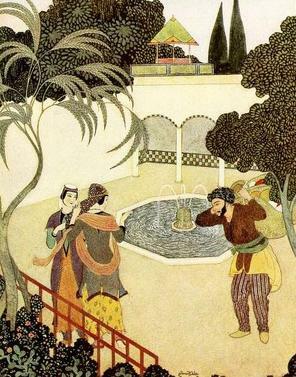 “The porter, who was greatly pleased by her appearance and voice, jumped up at once, poised his basket on his head, and accompanied the lady.” Illustration by Edmund Dulac, published in Sinbad the Sailor & Other Stories from the Arabian Nights (1914), Weathervane Books. The lady soon stopped before a closed door, at which she knocked. It was opened by an old man with a long white beard, to whom the lady held out money without speaking. The old man, who seemed to understand what she wanted, vanished into the house, and returned bringing a large jar of wine, which the porter placed in his basket. Then the lady signed to him to follow, and they went their way. When they were both inside the door was fastened, and they all three entered a large court, surrounded by an open-work gallery. At one end of the court was a platform, and on the platform stood an amber throne supported by four ebony columns, garnished with pearls and diamonds. In the middle of the court stood a marble basin filled with water from the mouth of a golden lion. The porter looked about him, noticing and admiring everything; but his attention was specially attracted by a third lady sitting on the throne, who was even more beautiful than the other two. By the respect shown to her by the others, he judged that she must be the eldest, and in this he was right. This lady’s name was Zobeida, the porteress was Sadie, and the housekeeper was Amina. At a word from Zobeida, Sadie and Amina took the basket from the porter, who was glad enough to be relieved from its weight; and when it was emptied, paid him handsomely for its use. But instead of taking up his basket and going away, the man still lingered, till Zobeida inquired what he was waiting for, and if he expected more money. “Oh, madam,” returned he, “you have already given me too much, and I fear I may have been guilty of rudeness in not taking my departure at once. But, if you will pardon my saying so, I was lost in astonishment at seeing such beautiful ladies by themselves. A company of women without men is, however, as dull as a company of men without women.” And after telling some stories to prove his point, he ended by entreating them to let him stay and make a fourth at their dinner. The ladies were rather amused at the man’s assurances and after some discussion it was agreed that he should be allowed to stay, as his society might prove entertaining. “But listen, friend,” said Zobeida, “if we grant your request, it is only on condition that you behave with the utmost politeness, and that you keep the secret of our way of living, which chance has revealed to you.” Then they all sat down to table, which had been covered by Amina with the dishes she had bought. After the first few mouthfuls Amina poured some wine into a golden cup. She first drank herself, according to the Arab custom, and then filled it for her sisters. When it came to the porter’s turn he kissed Amina’s hand, and sang a song, which he composed at the moment in praise of the wine. The three ladies were pleased with the song, and then sang themselves, so that the repast was a merry one, and lasted much longer than usual. “Do not be so angry, my good man,” replied the Calender; “we should be very sorry to displease you;” so the quarrel was smoothed over, and supper began in good earnest. When the Calenders had satisfied their hunger, they offered to play to their hostesses, if there were any instruments in the house. The ladies were delighted at the idea, and Sadie went to see what she could find, returning in a few moments laden with two different kinds of flutes and a tambourine. Each Calender took the one he preferred, and began to play a well-known air, while the ladies sang the words of the song. These words were the gayest and liveliest possible, and every now and then the singers had to stop to indulge the laughter which almost choked them. In the midst of all their noise, a knock was heard at the door. Now early that evening the Caliph secretly left the palace, accompanied by his grand-vizir, Giafar, and Mesrour, chief of the eunuchs, all three wearing the dresses of merchants. Passing down the street, the Caliph had been attracted by the music of instruments and the sound of laughter, and had ordered his vizir to go and knock at the door of the house, as he wished to enter. The vizir replied that the ladies who lived there seemed to be entertaining their friends, and he thought his master would do well not to intrude on them; but the Caliph had taken it into his head to see for himself, and insisted on being obeyed. “Madam,” returned the vizir, “you shall be obeyed. We have quite enough to please and interest us without troubling ourselves about that with which we have no concern.” Then they all sat down, and drank to the health of the new comers. While the vizir, Giafar, was talking to the ladies the Caliph was occupied in wondering who they could be, and why the three Calenders had each lost his right eye. He was burning to inquire the reason of it all, but was silenced by Zobeida’s request, so he tried to rouse himself and to take his part in the conversation, which was very lively, the subject of discussion being the many different sorts of pleasures that there were in the world. After some time the Calenders got up and performed some curious dances, which delighted the rest of the company. When they had finished Zobeida rose from her seat, and, taking Amina by the hand, she said to her, “My sister, our friends will excuse us if we seem to forget their presence and fulfil our nightly task.” Amina understood her sister’s meaning, and collecting the dishes, glasses, and musical instruments, she carried them away, while Sadie swept the hall and put everything in order. Having done this she begged the Calenders to sit on a sofa on one side of the room, and the Caliph and his friends to place themselves opposite. As to the porter, she requested him to come and help her and her sister. The same ceremony was gone through with the second dog, and all the while the whole company looked on with astonishment. The Caliph in particular could hardly contain himself, and made signs to the vizir to ask what it all meant. But the vizir pretended not to see, and turned his head away. Amina struck a few chords and then broke into a song, which she sang with so much ardour that she was quite overcome, and sank gasping on a pile of cushions, tearing open her dress as she did so to give herself some air. To the amazement of all present, her neck, instead of being as smooth and white as her face, was a mass of scars. The Calenders and the Caliph looked at each other, and whispered together, unheard by Zobeida and Sadie, who were tending their fainting sister. “What does it all mean?’ asked the Caliph. “We know no more than you,” said the Calender to whom he had spoken. “It is,” they all replied, except Giafar, who was silent. “Is this,” continued Zobeida, growing more angry every moment, “is this the return you make for the hospitality I have shown you? Have you forgotten the one condition on which you were allowed to enter the house? Come quickly,” she added, clapping her hands three times, and the words were hardly uttered when seven black slaves, each armed with a sabre, burst in and stood over the seven men, throwing them on the ground, and preparing themselves, on a sign from their mistress, to cut off their heads. The seven culprits all thought their last hour had come, and the Caliph repented bitterly that he had not taken the vizir’s advice. But they made up their minds to die bravely, all except the porter, who loudly inquired of Zobeida why he was to suffer for other people’s faults, and declared that these misfortunes would never have happened if it had not been for the Calenders, who always brought ill-luck. He ended by imploring Zobeida not to confound the innocent with the guilty and to spare his life. Meanwhile Zobeida had turned to the three Calenders and inquired if, as they were all blind, they were brothers. Zobeida put the same question to the other two Calenders, and received the same answer. “Oh, madam,” cried the porter, “let me stay yet a little while. It is not just that the others should have heard my story and that I should not hear theirs,” and without waiting for permission he seated himself on the end of the sofa occupied by the ladies, whilst the rest crouched on the carpet, and the slaves stood against the wall. Then one of the Calenders, addressing himself to Zobeida as the principal lady, began his story.